Box Office: Salman Khan-Katrina Kaif Starrer Tiger Zinda Hai First Tuesday Business! Home BOLLYWOOD Box Office: Salman Khan-Katrina Kaif Starrer Tiger Zinda Hai First Tuesday Business! Tiger Zinda Hai that sees Salman Khan and Katrina Kaif back onscreen after five years, is creating magic at the Box Office. Bollywood actors Salman Khan and Katrina Kaif starrer Tiger Zinda Hai is unstoppable at the Box Office. The film that is receiving rave response from all over, entered to 100 crore club in just flat three days. The film, which also stars Paresh Rawal, Angad Bedi, Kumud Mishra and Girish Karnad, is receiving fabulous response all over the world. After an amazing Monday, TZH continues to rule the Box Office like a boss on its first Tuesday as well. While Salman Khan is celebrating his 52nd birthday today at his Panvel farmhouse, his recently released film is keeping his fans entertained. 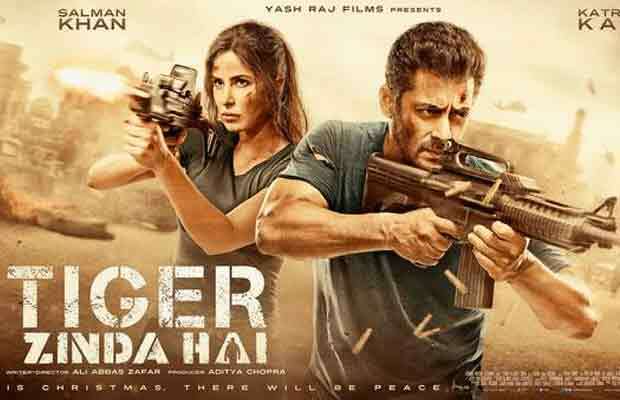 Tiger Zinda Hai collected Rs 35.50 crore net approx on its first Monday. The film has witnessed a good fall on fifth but that’s justified. After a big holiday, the film has still earned huge on Tuesday. According to early estimates, Tiger Zinda Hai has made Rs 21 crore net (approx) on Tuesday, thus taking the total to Rs 172 crore net (approx). If TZH touches Rs 200 crore mark by the end of its first week, it will be second Hindi film to set the benchmark in just a week. At the moment, Salman Khan’s Sultan holds the first position. Previous articleBox Office: Fukrey Returns Crosses 75 Crores Mark! Next articleWatch: Shah Rukh Khan Makes Virat Kohli Lip-Sync Jab Tak Hai Jaan Dialogue, Anushka Sharma Can’t Stop Laughing!